Is AHRQ's National Guideline Clearinghouse disappearing for good tomorrow? The AHRQ was started 30 years ago in 1999 when it was renamed from the Agency for Health Care Policy and Research (AHCPR) to the Agency for Healthcare Research and Quality (AHRQ) by legislative action. I have referenced their guidelines on this blog for ADHD and depression. The post on the depression guideline illustrated that AHCPR guidelines were generally of higher quality than the current managed care guidelines and screening guidelines. Even looking at the web site today before it is taken down illustrates the depth of research and recommendation on the site. A search for psychiatry yields 600 references including research and policy recommendations. Interesting the guidelines at guidelines.gov has 74 psychiatric guidelines ranging from depression in children and adolescents to a guideline for CYP2D6 and CYP2C19 genotypes and dosing of tricyclic antidepressants. A wide number of physician and nonphysician organizations have produced the guidelines. These are unique sites with few comparable sites in the world. Only the National Institute for Health and Care Excellence (NICE) in the UK seems similar. The NICE guidelines are produced by a more uniform methodology rather than disparate organizations. When the current administration announced it was defunding AHRQ guidelines, there was some hope that someone else would take it over - at least the existing databases. Some physician professional organizations were suggested. Given the government's shaky history of ancient information technology and dubious failed upgrades, I am speculating that would be the reason why nobody else would want to take that on. Clearly nobody in the administration is interested in a smooth transition. The smoothest transition I can think of would be to make the data available through the National Library of Medicine and their collection of databases. But as I type this there are about 8 hours to make that transition. There are several serious questions for the Trump administration. Some are speculative, but when people question how doctors are influenced by a slice of pizza, I think it is reasonable to ask about health care corporations that are influenced by tens to hundreds of billions of dollars and how they influence politicians. 1. How does it make sense to take this data and these initiatives offline when the costs are trivial compared to other government projects? Cost analyses have been done showing not much of a price increase corrected for inflation. Various analyses have been suggested such as this one pointed out the agency's role in reducing hospital infections resulting in 124,000 fewer fatalities per year a cost saving of about $28 billion. 2. And possibly even more important - what are the conflicts of interest involved? The most significant one that I can see is that industry guidelines and standards go unchecked. There are any number of groups that are primarily comprised of health care executives that are producing standards of care that have nothing to do with medical practice or standards. Review practices by pharmaceutical benefit managers come under the same category. These physician intimidation strategies have nothing to do the scientific evidence or quality of care. In this regard the wholesale suspension of guidelines that counter industry practices are suddenly gone. It is far easier to do than reverse Environmental Protection Agency (EPA) regulations - but the zeitgeist is the same. Taking down AHRQ means there is one less place in government healthcare sites with the word quality. I don't think that is an accident either. Today's healthcare industry would rather advertise how they are the best without using the quality word or any scientifically valid metrics. 3. As a corollary to the above - what about the professional guidelines that are collated and listed on the site? I don't have the time to follow other physician professional organizations but the American Psychiatric Association has fallen off greatly over the years. Critical issues have not been addressed in some cases for decades. The commonest cause for this problem is cited as the expense it takes to collect all of the experts and data, but in the information age it would seem to be easier than ever. I speculate the the real reason is that these guidelines are just ignored. Why produce a hundred page guideline on all the aspects of the treatment of depression when the dominant managed care standard is a 2 minute screening exam and an antidepressant prescription? Why produce that document when it affects only 5% of the work force for mental disorders? Why produce that document when the psychiatrists involved have so little political leverage against the industry and the government that they can never use it. AHRQ at least provided a broader forum for discussion. 4. Why the minimal notification and lack of feedback? There are so many guidelines and so much information available on this site, it is impossible to know who is using it all and for what purpose. Unilaterally taking down a resource like this with 4 months notice has to be considered nothing more than a political decision at this point. If the number of people and organizations accessing this site was published somewhere - I have never seen it. 5. What about the Centers for Medicare and Medicaid services, the CMS web site? Since CMS is essentially the billing and regulatory web site for Medicare - I don't think it is any danger of being shut down. But it does promote and spread a lot of unscientific information that is biased toward running the business side of health care at the expense of the medical side. It is a massive bureaucracy that is responsible for the bulk of physicians paperwork burden every day. Some clear evidence for the lack of science is psychiatric diagnosis related groups and how they don't accurately reflect diagnoses or the expected course of treatment for hospitalized psychiatric patients. The most recent post on this blog looks at the rationing of inpatient psychiatric services and how a lot of that has resulted from CMS regulation. Just a few years ago, I wrote a blog piece about a 55 page CMS document about what psychiatrists would have to do to document the diagnosis and treatment of depression. That was subsequently taken down. 6. Finally what does this imply for other federally funded information programs? My biggest concern in this era of massive profits for publishers is the National Library of Medicine (NLM) - commonly used by physicians offices on a daily basis. It is a major resource for researchers, but it is also becoming a competitor for profitable online publishers. If research is publicly funded - a copy is accessible without charge on the PubMed web site. Will the day come when for profit medical publishers have enough leverage to put the NLM out of business? Stranger things have happened. It is easy to blame that President Trump. He is heading the first blatantly anti-science and pro-business administration that I can recall in my decades of existence. But the reality is that the American healthcare system has been designed by an endless stream of bad decisions for the past 30 years all occurring in the confluence of special interest politics and massive special interest money with a little medical science (and a few doctors) sprinkled in. The press seems to focus on the influence of pharmaceutical companies, but the bulk of those bad decisions have been rationing decisions by the managed care industry. 1: Heslin KC (AHRQ), Weiss AJ (Truven Health Analytics). Hospital Readmissions Involving Psychiatric Disorders, 2012. HCUP Statistical Brief #189. May 2015. Agency for Healthcare Research and Quality, Rockville, MD. http://www.hcup-us.ahrq.gov/reports/statbriefs/sb189-Hospital-Readmissions-Psychiatric-Disorders-2012.pdf. I pulled the following figures on lengths of stay for mood disorders and schizophrenia out of the above article. If the site goes down at midnight this may be the only place that you can find it and any paper referencing it may lead to a dead end. 07/16/2018: 3:30 PM AHRQ.gov web site is up and running at this point but guidelines.gov is not found. I read a paper yesterday (1) on psychiatric bed policy with a focus on OECD (Organisation for Economic Cooperation and Development) nations. The OECD has extensive data collection on their member nations and one of the metrics they collect is the number of psychiatric beds per 100,000 inhabitants. I have demonstrated some of this data before. For the purpose of this post I downloaded it to create the two graphs above that were used in the paper. One of the authors main points was transinstitutionalization - in this case sending people with serious mental illnesses to jails rather than psychiatric hospitals. They demonstrate the rough inverse correlation between psychiatric beds and the rate of incarceration. Throughout my career available psychiatric beds has always been a problem. It has been a favorite topic on this blog. I was interested in whether or not this group of authors had anything new to say. In their introductory section, they provide the back drop with the numbers. The American state hospital psychiatric beds fell 97% from 558,922 in 1955 to 37,679 in 2016. In Minnesota, the drop was about 98.5% from 11,449 in 1955 to 175 currently. Using the OECD data, the average was about 99 beds per 100,000 population in 1998 to 71 per 100,000 in 2015. Only Germany trended in the other direction by increasing the number of beds. They do a fairly good job of analyzing the risks of the bed shortage. They cite rehospitalizations, prolonged stay in emergency departments, pressure to discharge patients from inpatient setting, more frequent involuntary treatment, and associated staff burnout. They make the argument that higher rates of suicide are noted in community treatment compared to hospitals where suicide is less likely. They believe acute inpatient care is less available to the acutely suicidal patient and that may account for some increase in the suicide rate. Scandinavian registry studies are cited as providing some confirmatory data with one group of authors stating that the reduction in beds was the "most probable explanation for the rising mortality." A similar study in Finland where more community resources were available and the beds were at OECD averages described fewer suicides. Community treatment is typically cited as a reason for the bed reduction. In the USA, rationing is more clearly the reason since the community resources are rarely developed to compensate for the bed loss. It is also unstated that the two treatments are not equivalent. They cite the UK as having extensive community resources that were not enough to overcome the drop in beds leading to higher rates of suicide, transfers out of the area where the patient lives, and involuntary treatment. From the graph, the UK has more beds than the OECD average. The history of transinstitutionalization is briefly discussed. The Penrose Hypothesis was developed by Lionel Penrose who pointed out the inverse relationship between mental hospital and prison populations in 1939. Other authors like Harcourt look at historical data and note the same relationship but discuss it from the perspective of the institutionalized population. At one point in his book Harcourt suggests that people in the military and in nursing homes may need to be counted as being institutionalized. Inspection of the bar graphs at the top of this page does illustrate some clear trends but it also illustrates that the relationship is complex and not all of the variables have been studied. They include a third graph of the Gini coefficient that I did not include. The Gini coefficient is a measure of income disparity (approaching 0 means less disparity). The 10/17 countries with Gini coefficients > 0.3 had the lowest number of psychiatric beds. In other words, more income disparity translates to fewer psychiatric beds. The statistics about the incarcerated mentally ill in the USA are reviewed and the numbers are significant. Twenty percent of the incarcerated population or 350,000 people per day are estimated to have serious mental illness. The problems that I have written about on this blogs for years are highlighted including the declining length of stay and what the authors called revolving door admissions. They point out that schizophrenia has the second highest readmission rate at 1 month compared with any other diagnosis (congestive heart failure is first). The lengths of stay are not generally long enough to allow for adequate stabilization of severe psychiatric disorders and they provide the references. I see this population of people as a steady state group that goes from jail to homelessness to a short stay in the hospital. Substance use disorders are generally not addressed or treated in a cursory manner. The paper's strength is that they provide an estimate of what a reasonable number of psychiatric beds is for a given populations. The Royal College of Psychiatrists established a standard that would give psychiatric patients the same access to high quality medical care as medical and surgical patients. That includes 4 hour maximum time to wait for admission. They also said that bed occupancy should not exceed 85% to allow for emergency admissions and the length of stay figure should be 2-4 weeks to allow for real improvement. Using those parameters a US expert consensus group estimated that 50-60 publicly funded beds per 100,000 population were necessary. In case there is any difficulty reading the above graph, the point plotted was 25 beds per 100,000 US inhabitants - well below the estimated number. In my home state of Minnesota, that number falls off the precipice to 3 publicly funded beds per 100,000! A closing example is given of the situation in South Australia. Hospital beds were closed to a level of 32 per 100,000. Acute care occupancy exceeded 100%, emergency departments waits went up, acuity increased with increasing risk of the need for physical restraint, and the burden of care was often transferred to relatives and friends. Reforms were enacted that led to an increase to 35 beds per 100,000 with associated 2 week lengths of stay and decreased rates of suicide. This is an excellent paper for psychiatric societies and psychiatrists to read. It documents the problems that we all see on a daily basis and provides some clear answers. The answer does not lie with continued or more perfect rationing. Unfortunately the people who run these systems - largely bureaucrats in large state human services departments, the politicians who influence those bureaucrats, and administrators of most health care systems all see rationing as their only solution to the problem. They are incentivized to ration and we (and our patients) are left picking up the pieces. We finally have a paper that is making a stand against all of this rationing. Supplementary 1: Data for the top graph was downloaded directly from the OECD and accessed today (July 12, 2018). Supplementary 2: Data on incarceration rates was taken from the Prison Policy Initiative and accessed today (July 12, 2018). For both graphs click on them for expanded and improved resolution. 1: Allison S, Bastiampillai T, Licinio J, Fuller DA, Bidargaddi N, Sharfstein SS. When should governments increase the supply of psychiatric beds? Mol Psychiatry. 2018 Apr;23(4):796-800. doi: 10.1038/mp.2017.139. Epub 2017 Jul 11. PubMed PMID: 28696434. 2: Osby U, Correia N, Brandt L, Ekbom A, Sparén P. Mortality and causes of death in schizophrenia in Stockholm county, Sweden. Schizophr Res. 2000 Sep 29;45(1-2):21-8. PubMed PMID: 10978869. 4: Royal College of Psychiatrists. The Commission to review the provision of acute inpatient psychiatric care for adults. OLD PROBLEMS, NEW SOLUTIONS: Improving acute psychiatric care for adults in England. February 2016. Link This is a detailed look at bed capacity including current estimates and what can be done to improve it. I have been waiting for this paper (1) to come out for the past 6 months. I posted on the very interesting nocebo effect in antidepressant trials and why it was so interesting and in the process learned that the lead author - Seetal Dodd had a paper being reviewed on the nocebo effect in bipolar trials. That paper finally came out and I had the pleasure of reading it and presenting it here. As a brief refresher, the nocebo effect is an adverse drug experience or worsening based on taking placebo or inactive medication in a clinical trial. At the clinical level, it can also be an unrealistic reaction to a medication based on similar response. Any researcher who has participated in clinical trials that all breaking the protocol and allow the subject to be informed about whether they were taking active drug or placebo has probably observed this effect. Clinicians commonly see it as an improbable reaction to a medication or in some cases multiple medications. 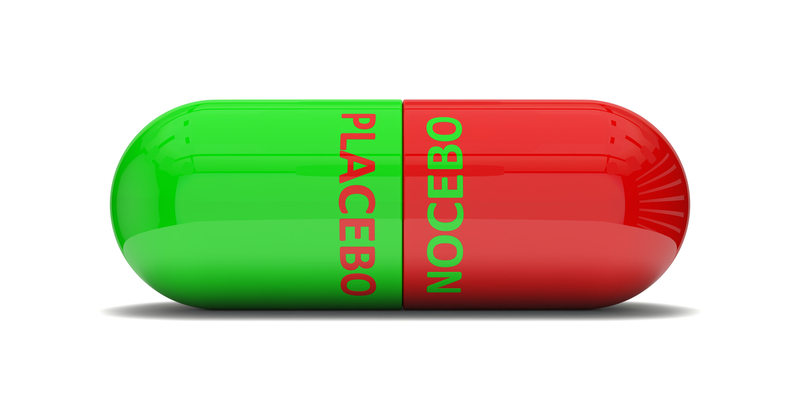 It is an important phenomenon because it blurs the results of clinical trials by making it seem that there is less difference between placebo and the active drug being studied. It also may lead to the rate of actual adverse events due to the study drug being underestimated. For the purpose of this study the nocebo response is defined as any a treatment emergent adverse events (TEAE) or clinical worsening in people treated with a placebo. That involves collecting data on both TEAEs and rating mania and depression. The data used in this study was from a randomized placebo controlled clinical trial of olanzapine monotherapy for bipolar disorder versus placebo and several comparators (haloperidol, valproate, olanzapine-fluoxetine combination [OFC]). The trials occurred between 1996 and 2007. There were a total of 9 studies and 7 were published. Only data for the patients randomized to placebo (N = 1185/4680) were used for the purpose of this study and meta-analysis. 866/1185 or 68% experienced (TEAE) and 4.6% discontinued the study due to a TEAE. Typical rating scales for mania and depression were used to rate symptoms. TEAEs were significant ranging from 3% to 11.8% of the placebo treated group. Headache, insomnia , somnolence, anxiety, nausea, diarrhea, irritability, and agitation all occurred in over 5% of the placebo treated patients. Median time to report the TEAE was 16 days with the longest time of 37 days. Apart from the TEAEs, a significant number of the placebo treated patients experienced clinical worsening as noted on the rating scales for depression (321 or 27%), mania (585 or 49%), or global function (278 or 23%). The 806 patients reporting TEAEs reported a total of 1,119 nocebo events. TEAEs were associated with not being treatment naive, being obese, being located in the US, and participating in an earlier study. There were no significant difference based on gender or smoking status. A major limitation of the study is that it is not possible to detect if clinical worsening is a nocebo effect or and the effect of worsening illness. In their discussion the authors point out that the evidence is that the nocebo effect is significant in clinical trials. Of all of the possible correlates they studied they di not find any that were useful to predict who might be a nocebo responder. They discussed some psychological theories and in a couple of additional papers discuss the putative neurobiological underpinnings of both the placebo and nocebo effect. Certainly any effect that leads to 4.5% or placebo treated patients discontinuing the study is significant. Until the nocebo effect is better characterized we probably do not have an adequate estimate of the side effect profiles. The authors describe is as similar to the placebo response as "an expected consequence of exposure to therapy." The nocebo response may be less clear in looking at the therapeutic effects of medication. I think it is good to remember that true nocebo/placebo effects are estimated on the placebo response. In other words a 20% placebo response rate means that 20% of the actively treated group also responded to placebo. Hence, if 68% of the placebo treated group experience TEAEs and 4.5% discontinue the study on that basis - what happened when those number are applied to the actively treated group? It would generally mean less subject carried forward in an intent-to-treat analysis and and a more favorable side effect profile if the nocebo responders could be accurately identified. A good place to start to look for more accurate numbers and methods of identification may be in large scale medicine studies looking at an identifiable quantitative endpoint like blood pressure. The nocebo effect is easier to sort out with a medication that has a clear effect on a more easily measured parameter. Clinicians are left with estimating the likelihood of a TEAE or nocebo response based on the likelihood of a patient exhibiting a particular side effect. A low likelihood of a particular presentation is fairly frequent in clinical practice and continuing the medication in those circumstances often comes down to clinical necessity. As an example, the patient has a vague TEAE, but learns from the physician that there are no other medications that can be prescribed for the problem. Nocebo responses are certainly out there. Clinically we can be more specific until there is better research guidance on what to do about it. I have had conversations with many people who were interested in the placebo response or why a particular pattern of responding to a therapeutic intervention may have been established. 1: Dodd S, Walker AJ, Brnabic AJM, Hong N, Burns A, Berk M. Incidence and characteristics of the nocebo response from meta-analyses of the placebo arms of clinical trials of olanzapine for bipolar disorder. Bipolar Disord. 2018 Jun 21. doi: 10.1111/bdi.12662. [Epub ahead of print] PubMed PMID: 29926533. I was just starting to breathe a little heavier. The nurse running the test has been talking to me - continuously for the last nine minutes. She was bright, pleasant, a great conversationalist but more to the point - everything she said seemed highly relevant. From time to time she would ask how I was doing, check my blood pressure and tell me what my heart rate was. Some time at about the 9 minute mark she said that I might need to break into a jog for the next level. It was a 16% grade at 4.1 mph. The treadmill tilted up and it was a smooth transition. I was still walking at a fast pace. "Your heart rate is 160 are you OK?" I was feeling very good. Still talking in full sentences and not feeling stressed at all. My left knee was sore and I said: "My knee is sore and I don't want to break into a jog. I will complete this stage and call it a day." I did have room at the end and am fairly confident I could have knocked off the next stage. I have done it many times in the past starting with a test at about ago 42. There were a number of considerations holding me back. The knee. It was nothing big. When you exercise a lot as an adult - episodic knee pain is all part of it. Secondly, a history of paroxysmal atrial fibrillation. I probably got it in the first place from running heart rates too high for my age. I did not want to flip into another episode of atrial fibrillation. Third, the target rate. Before starting, the supervising nurse told me that the target heart rate for a guy my age was 140 bpm and I was over that with no signs of ischemia or more importantly a widening QRS interval (I take flecainide). Fourth, I was just happy to be there. Even though I have had 5 exercise stress tests over the last 25 years, the last one was at the Mayo Clinic about 10 years ago. These things are a lot less certain with age. As I was on the treadmill, I kept thinking of a review I read in the Medical Clinics of North America many years ago: "40% of 85 year olds have significant coronary artery disease". Of course those are the 85 year olds who survived to that age. I had other associations while I was walking and talking. I take a cardiac history on every person I talk with. Some are more detailed than others. I know a number of ways that stress tests can be failed. 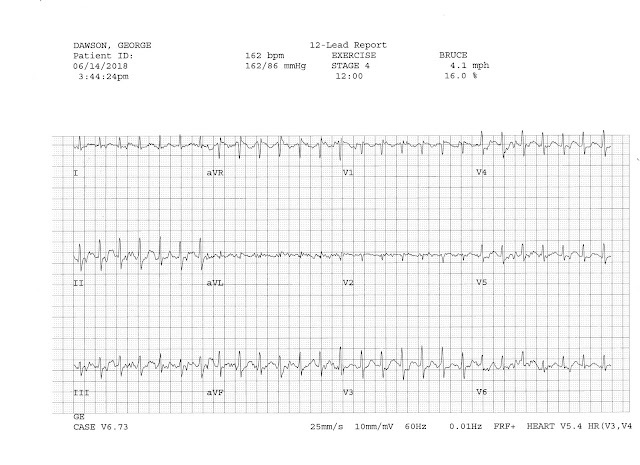 I know from talking with people what happens when your ECG suddenly shows signs of ischemia. Generally the next step is a Cardiologist spraying nitro into your mouth. I also know that passing a stress test is a generally a good sign, but it is not a guarantee. Nothing in medicine is. Too many people have told me about cardiac problems in the absence of a positive stress test, including an infarction in the absence of any occlusions. Irrespective of the result, I would maintain humility and strive even more to avoid the trans fats that are quantitatively too low to make it on the food label. And of course all of that bakery with thick frosting - the first display you encounter in any supermarket. I had the exercise stress test two weeks ago. Four days earlier I was doing my usual dictation of an assessment in my office and as I stretched back - I experienced an intense sharp burning pain going down the left side of my sternum. It lasted about 5- 10 seconds. I have been having this pains for at least a year all over the chest, left shoulder and back. At one point they were clearly musculoskeletal in origin and I could replicate them by certain movements or flexing certain muscles. But then the discriminatory ability was gone. All of the tricks I learned in medical school and residency about the difference between musculoskeletal pain and true cardiac pain or angina did not apply. One of the things they never teach you is that when you get old - all of the routine pains that you live with every day meld into vague pains all over your torso. Was that chest pain or did it originate in my back, neck or shoulder? Arthritic pain or pain from trying to do too many pull ups last night? At some point I just decided to go in to see my internist to see if we could figure it out. My internist has known me for 30 years. Any chest pain in the early part of that period was immediately dismissed as musculoskeletal pain. He knew I was a compulsive exercise fanatic and between the ages of 30 and 55 probably cycled 200 miles per week or the equivalent. In the winter, I would speedskate as much as possible. My goal was to end the season by doing as many laps as possible in an hour on the John Rose Oval - one of the few refrigerated speedskating outdoor tracks in North America. Doing that kind of exercise gets the heart rate up to very high levels. During interval training up to 190+ beats per minute. Whenever the subject came up during those years my internist would say: "You do a stress test every time you exercise". That all changed at age 55. I was out doing a warm up on the speed skating track. I looked down at my heart rate monitor and it read 170 bpm. One lap later it was chirping loudly and now it read 240 bpm. 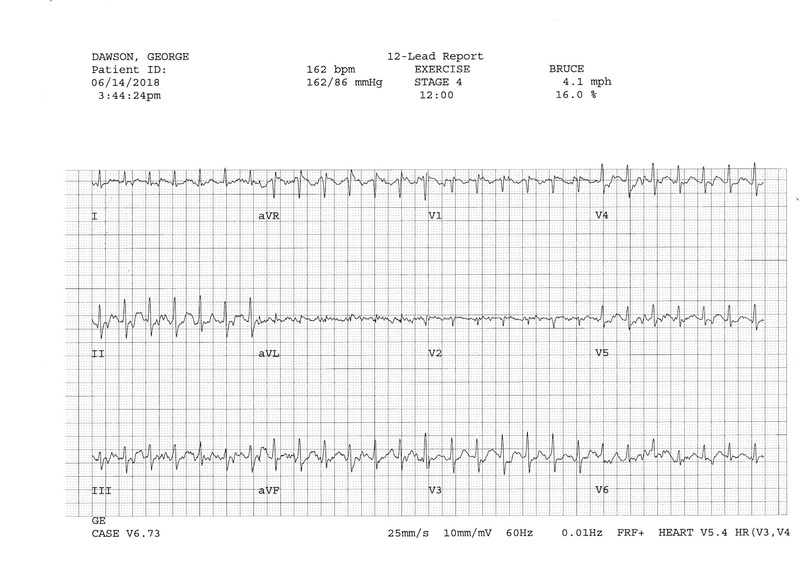 I felt my carotid pulse and it was the irregularly irregular rhythm of atrial fibrillation. That led to 2 hospital admissions, 2 cardioversions, 2 consultations with a sports cardiologist at the Mayo Clinic and 2 exercise stress tests on a bicycle at Mayo. I ended up on flecainide with the advice to consider an ablation procedure at some point in the future as long as the flecainide continued to work and "if the technology improves". That is a direct quote from one of my electrophysiologists. During the bicycle stress tests, I ran my heart rate up to 170 bpm and could have gone higher, but was concerned about triggering another episode of atrial fibrillation that would no longer respond to flecainide. On echocardiography, I have features that are seen in some series of cyclists who do high levels of dynamic exercise - primarily an large left atrium and a slightly enlarged aortic root. During dynamic exercise, there is a steady increase in blood pressure despite the fact that stroke volume peaks at about 120 bpm and main contributor after that point is heart rate and sympathetic nervous system output. My adaptation was to try to keep my heart rate at 140 bpm or lower when exercising and lately 130 bpm. It is good to know I can go higher even for brief periods of time. So the coronary arteries may be OK, but that leaves paroxysmal afib and the enlarged aortic root/aorta. We have only recently discovered the role of the layered extracellular matrix in aortic anatomy. Like most of these structures disruption of those layers can result in permanent weakness. It is also known that high levels of dynamic exercise results in aortic enlargement. I have not seen any outcome studies of those individuals - but it would be useful to find an expert. "I don't want to die on the side of the road from a blown aorta because I tried to race a 40 year old up a hill. I need your most conservative estimate on how I can prevent that." Previous exercise stress test done on a bike at the Mayo Clinic in 2012 showed a similar result (possibly low BP and heart rate this time but I find that it is easy to over rev on a bike as opposed to a treadmill).